6 Hour lesson package is our most popular for beginners. Lesson can be split over 2-3 days (2-3hrs/day) with this package most people go from complete newbie up to their first rides on the board. We cover all safety systems and kite control on land and in water. Please note: kiteboarding is a progressive sport and everyones learning skills and physical abilities are different. In other words, some people learn quicker than others but we can guarantee we will advance as much as possible and you will have loads of fun! All gear (Kite, board, harness) during lesson and private coach. some wetsuits are available however we recommend students to bring their own wetsuit du to hygiene and proper fit. 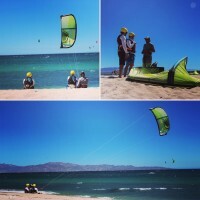 Evolution kiteboarding is located in Baja California, Mexico, the beautiful coastal town of La Ventana is graced with steady winds in a Large L-shaped bay. The conditions are perfect for both beginners as well as more advanced kite surfers and windsurfers and the best time to catch the wind is between November and March. The sparkling waters were declared by UNESCO to be a World Heritage Site for its abundance of sea life and natural beauty so rest assured the water quality is great. Enjoy warm, sunny days giving the perfect backdrop for your wind powered sport of choice, plus you can look forward to some awesome Cali-Mex cuisine when you get out after a hard day on the water. We are IKO certified and use the most advanced and safest teaching techniques along with the latest gear, to ensure our students will have the best learning experience. We split our year in 2 great locations. We spend November to March in La Ventana, Baja California Sur, Mexico. Then June to September in The Magdalen islands, QC, Canada. We also do organized downwinders and help you sort out your accommodations. Please contact us for more info. Evolution Kiteboarding team's primary goals are to help reduce the frustration level of learning kiteboarding and to accelerate the learning curve. All of EK's kiteboarding lessons offer one-on-one instruction for beginner, intermediate, and advanced students. This formula, which has proven extremely successful, allows instructors to tailor each kiteboarding lesson to individual learning needs. As a result, EK students become independent kiteboarders more quickly and safely. We also organize a few kiteboarding camps through-out the year for groups of 4-8 people and do a kiteboarding boot camp. An intensive 4-5 days of all day in the water training and pushing the limits.